The strategic game of Scrabble can travel with you, whether you\'re playing on trains, planes or mountaintops, the game goes where you go. 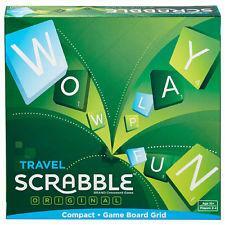 Travel Scrabble game features the classic playing board with a grid that keeps the tiles in place as you play - just drop in each letter as you spell out your next word. Score as many points as you can by forming words from the letters on your individual tiles. Then watch your opponent\'s face as you place that letter tile down on the Triple Word Score. Compact and portable, you can be on the move and the game moves with you. Can play with two to four players. Includes playing board, four racks, 100 letter tiles, a tile bag and rules. Colours and decorations may vary. Ages 10 and older.